These photos of the inside of villagers' homes were taken in a small village with 500 houses no more in Maharashtra, India, and there were no huts here. All pucca houses. 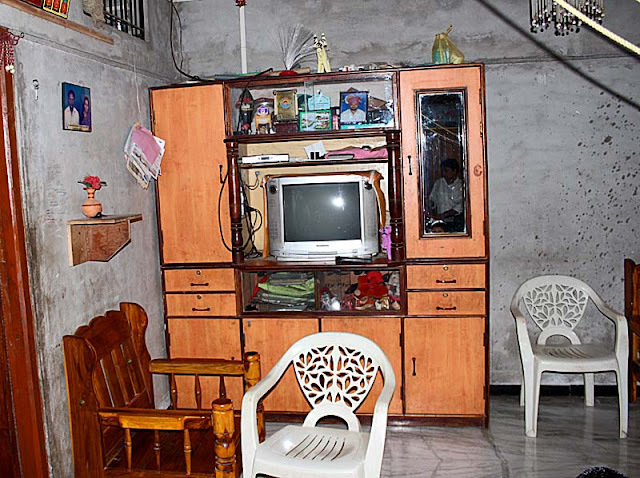 A curious aspect of houses in India (not just in rural homes) is that there is less of a demarcation between the different types of rooms. These photographs also demonstrate that rural India used consumer brands, with Parachute coconut oil and Colgate toothpaste found in almost every home! 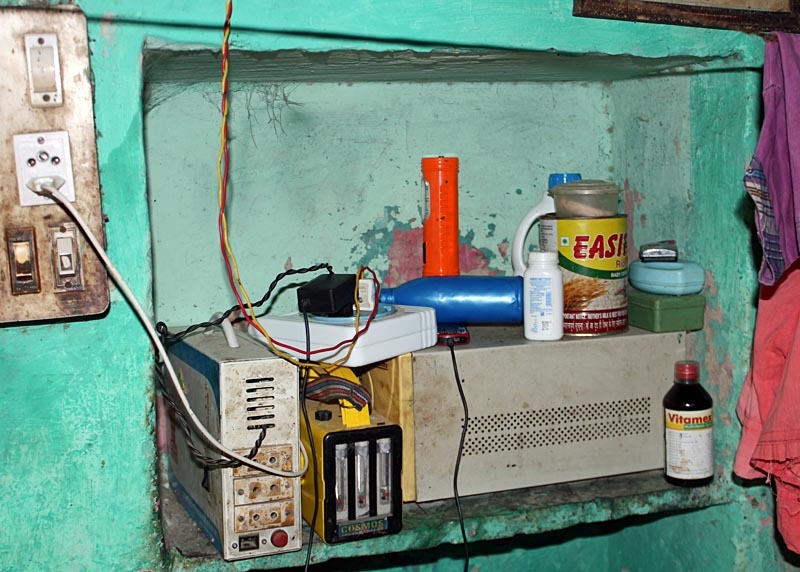 Consumer durables like refrigerators, coolers and generators and even hair dryers are used frequently in afflluent homes. FMCG products like talcom powder, toothpaste and even face wash is used. It is a myth that rural folk subsist on toothpowder and basic soaps! In these homes the kitchen often serves as a dining room and often even a living room where the family sits and spends time with each other. It also functions as a store-room with large containers with grains lined on the side. The distinction between the bedroom and living rooms is blurred, with the bed serving as a seating area. One is not sure why this is so. It could be because of numerous family members (in some cases two wives as was seen in this case) including several children. 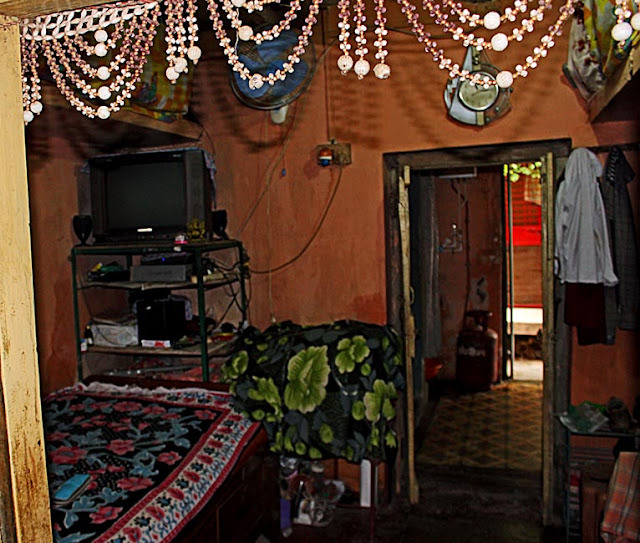 This makes it quite difficult to have separate rooms for everyone and rooms are thus shared. 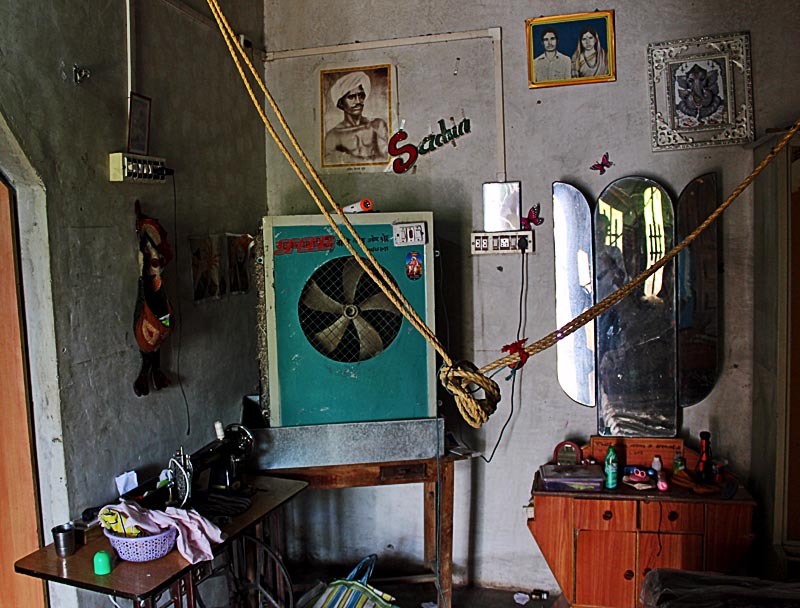 An air cooler in a village home. A photographed of a married couple, a poster of a celebrity or historical figure and a framed photograph of a diety (Ganesh) decorate the wall. 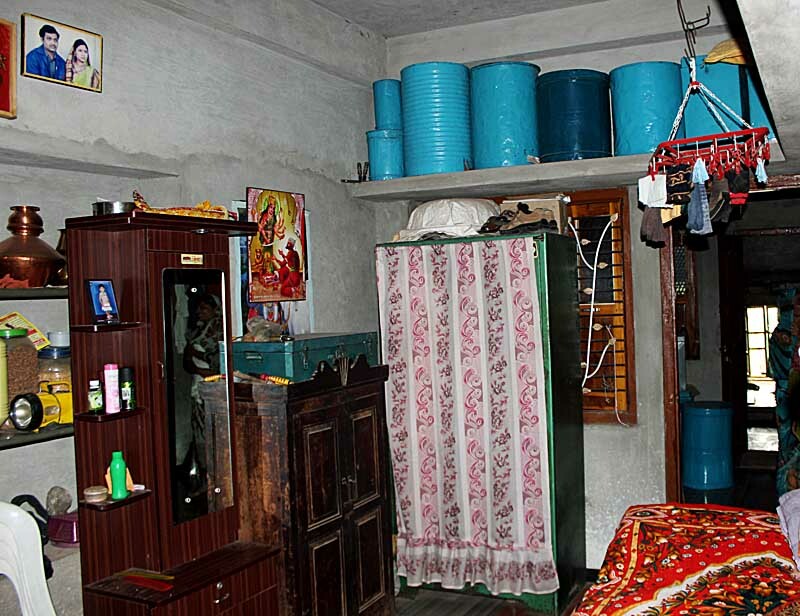 In this bedroom the attic area is used to store grains which are from their own farms. There is no shortage of consumer durables in rural homes. 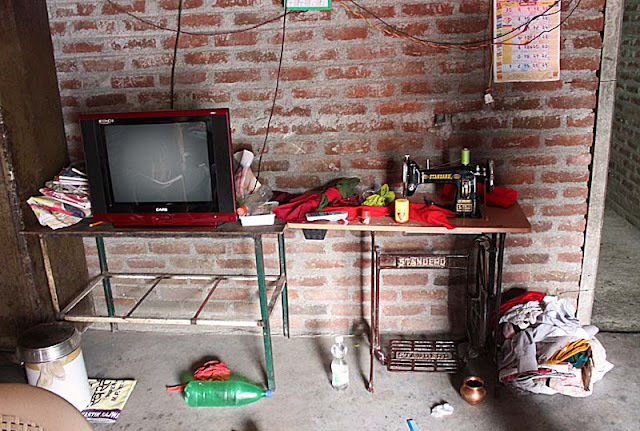 From a sewing machine, to television sets to coolers, it's all there although electricity plays truant. The furniture may not be swanky, and in fact cheaply made either of board or plastic, but it's there for its utilitarian value. These are closeups of different shelves in the house. This one is of a dressing table area. 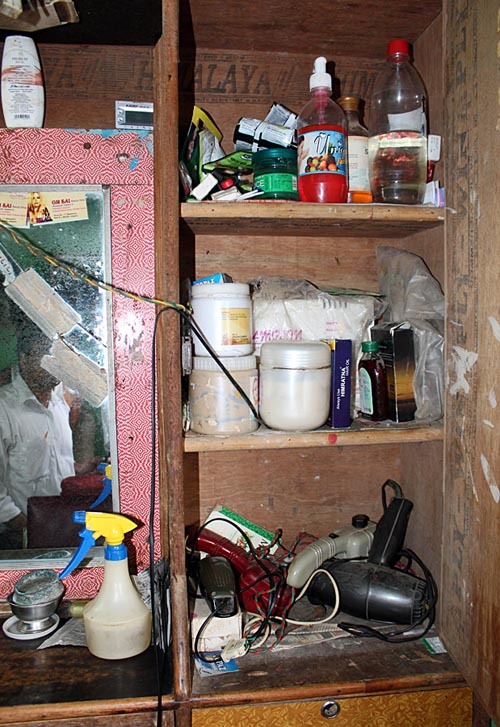 Dettol, a face wash and a couple of hair dryers lie around. 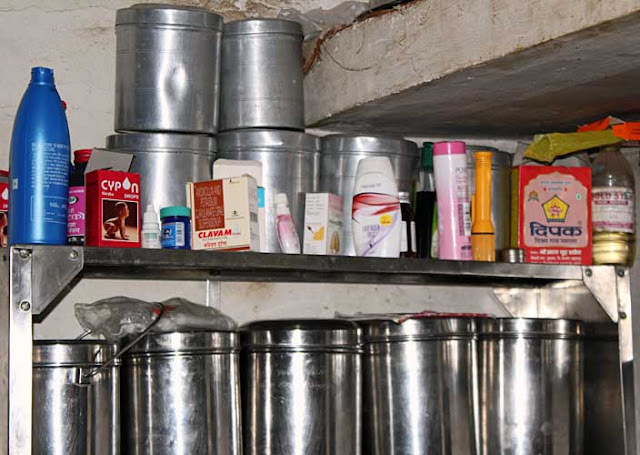 More FMCG goods seen here alongwith with branded medicines like Vicks Vaporub. 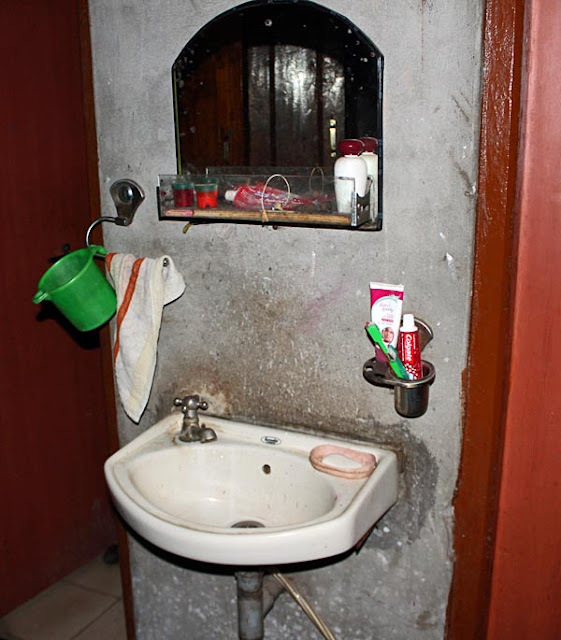 A wash-basin in a rural home with Colgate toothpaste and an after-shave lotion.